Taste test: These are pretty good kettle chips. They have a lot of flavor and a good crunch. 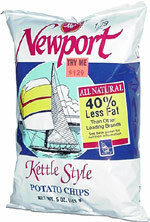 Not as good as the kettle chips made a little father east, on Cape Cod, but good nevertheless. Smell test: A good potatoey smell.